French-influenced dishes display owner-chef Bret Jennings’ finely honed skills. : Hardwood floors, bright and muted colors, white cloth-covered tables, many of them two-tops, and food-focused artwork create a vibrant space. 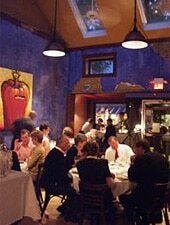 Though Elaine’s owner-chef, Bret Jennings, is rarely in the limelight, this little gem of a restaurant ranks among the best in the area. His creative seasonal dishes are based on cooking experiences in Thailand, Mexico and Europe, and served with a pinch of the American South. On our last visit, classic French dishes dominated the menu, executed with Jennings’ artful flair. We enjoyed the three-cheese soufflé surrounded by asparagus and morels, the fried soft-shell crab with Tabasco aïoli on a bed of tangy purple coleslaw, the black pepper-crusted tuna topped with hollandaise sauce, and Elaine’s rendition of Beef Oscar finished with fresh lump crab meat and beurre blanc. Southern flavors might include a quail confit with Anson Mills grits and braised wild watercress, or house-smoked pork tenderloin with sweet potato waffles. Dessert choices include the signature warm chocolate cake with vanilla ice cream and bourbon-caramel sauce. Jennings’ recommended wine pairings are inspired, and his wine list offers some of the most interesting bottles around, particularly hard-to-find Champagnes and intriguing selections from high-quality small producers. Stop by the cozy bar early for a reasonably priced glass of something special and stay for the $35 early bird dinner.